Prism 2 is Fly on a Wall’s second venture into exploring the abstract nature of prisms. Prism Study #1 premiered in September, 2014 as a part of Art on the Atlanta Beltline and utilized an 8ft plexiglass box to isolate and highlight human interactions. 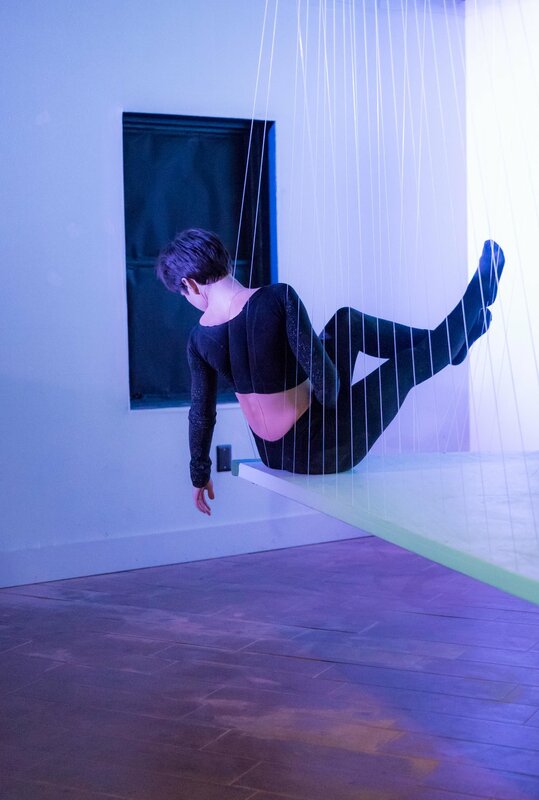 Prism 2, though vastly different from the first study, continues Fly on a Wall’s interest in performance structures by creating a floating floor suspended from the ceiling by harp string and monofilament. “We became interested in monofilament during our residency at The Hambidge Center last winter. 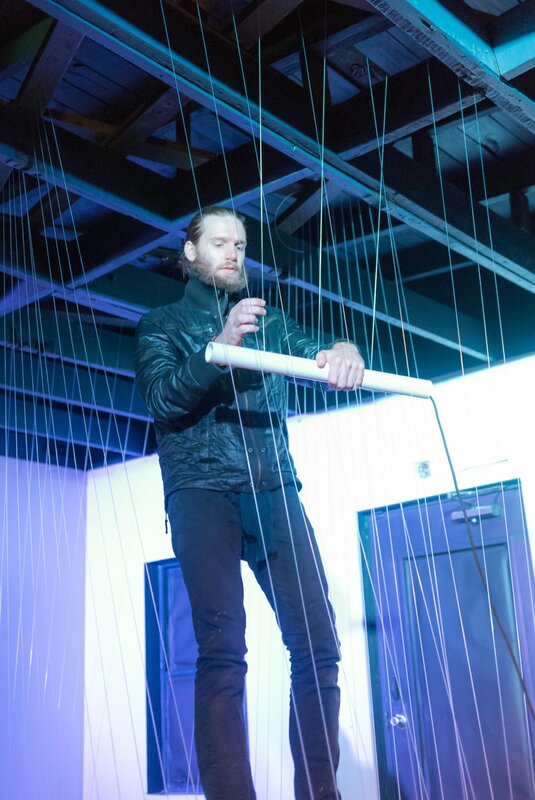 At first we imagined light and it’s refraction through the monofilament was our primary focus, however Nathan began building small floating platforms out of wood and suspending them with monofilament from the rafters. On our last day of the residency we decided to make an entire floor out of it. Then it struck us...what if we suspended it with musical string as well?” - Sean Hilton, Program Coordinator. Prism 2, funded in part by Idea Capitol, is being presented as an evening of open research and development. In this cafe environment the audience will be free to engage in conversation with fellow audience members and the Fly on a Wall team. 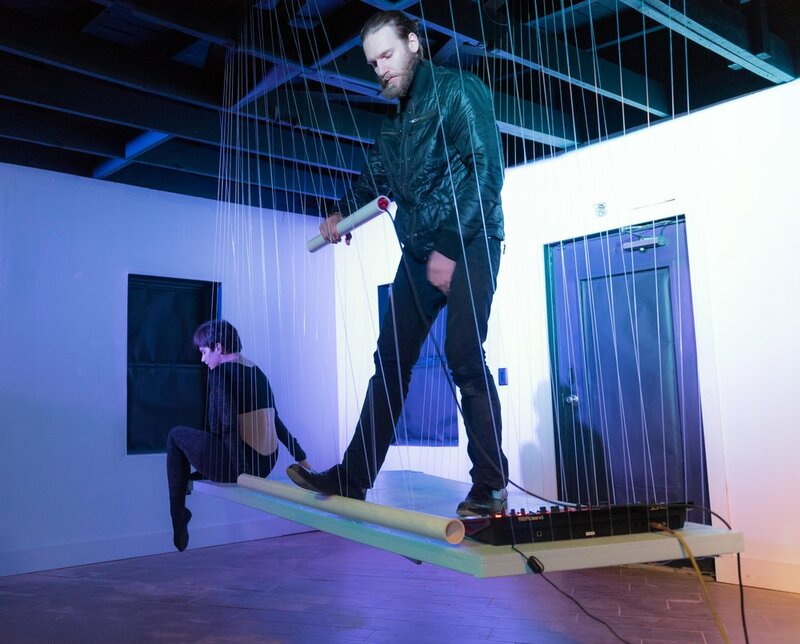 Fly’s Musical Coordinator, Jesse Tyler, will spend the evening discovering and manipulating sound made by the structure. 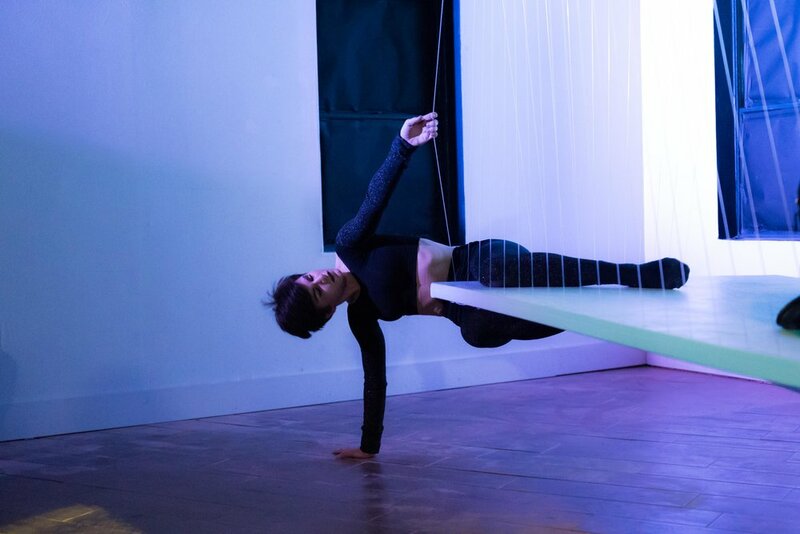 Through movement and subtle weight shifts the structure will reveal a musical landscape that the artists of Fly on a Wall will navigate with physical response. 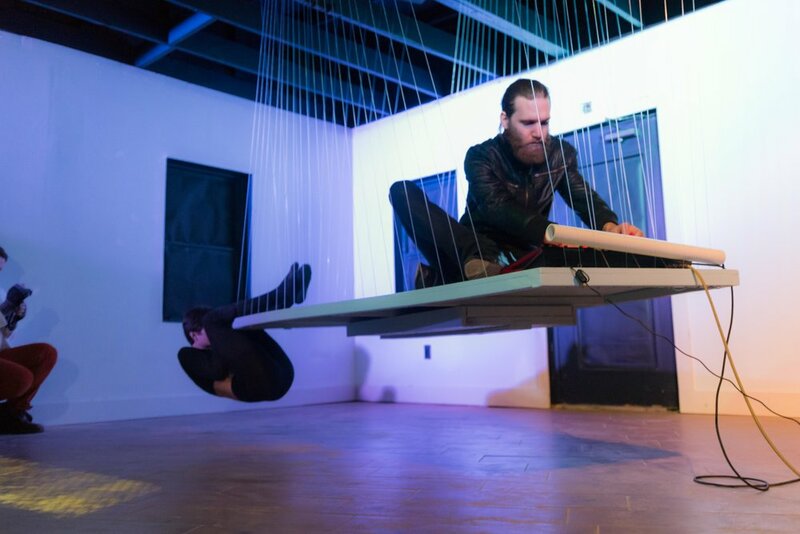 Prism 2 is the first phase of research and development for Fly on a Wall’s work on and around the floating floor. The primary focus of this evening will be to gather information and feedback, as well as to fold the public into the process surrounding this body of work. 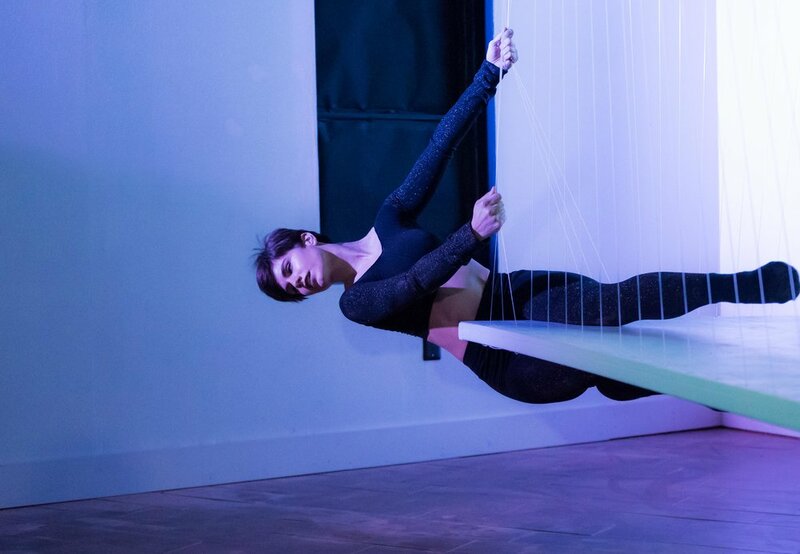 Prism 2 is funded in-part through an investment from IDEA CAPITAL, a community-based pool of funds created by and for the Atlanta arts community.